"I was looking through old photos and found one of Mrs. Kamp..."
"We are very sorry for your loss, Wayne and family." "Anne was the kindest, sweetest, caring person we have ever..."
"Anne was the center of calm in the CRHS Counseling Center...."
"We were so very sorry to hear of Anne's passing. 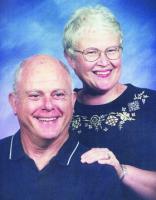 Our most..."
Anne Katherine Kamp, 75, passed away in Woodland, WA. She was born on June 16, 1940 to Karl and Jean Melde in Seattle, WA. She graduated from West Seattle High School and attended Central Washington University. Anne worked as a clerk for Columbia River High and as a staff assistant at Lake Shore Elementary in Vancouver. She enjoyed gardening, sewing, cooking, and collecting angels. She was a member of First Congregational Church and the Rose Society. loved and welcomed in every environment. Anne is survived by her husband of 56 years, Wayne Kamp; her children, Curt Kamp (Olga), Todd Kamp (Kathy), and Debbie Yackley; grandchildren, Stephanie Fredericks, Keefe Kamp, Shelby and Brady Yackley; great-granddaughter, Sophia Fredericks; siblings, Nancie Melde, Claire Melde, Chris Hill (Fred), and Sandy Stafford; and her precious granddogs, Holly and Molly. A funeral service will be held Sat., March 19, 2016 at 1:00 p.m. at First Congregational Church UCC, 1220 NE 68th St., Vancouver, WA. Please donate your time to or organization in her memory.